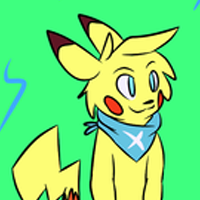 Sypnosis: Neon, a former human, now Pikachu stuck in the Pokemon world, must find his way back home, while making new friends along the way, whether he wants it or not. trying to fit in this strange new environment. WARNING: Future chapters may contain adult language, swearing, and violence. 2. Voice must be clear and audible and at least natural or believable. 6. Have at least a Discord account and let me know through comment or message that way it'd be easy once I get casted since the dub will be hosted on my Discord server. Those who will be casted will receive a message in either here of their account for a special invite. And note that this auditions are from starting from Chapter 1. To those who don't manage to get a part, don't worry... more characters will be up and available to be open for audition next chapter~ so there's another chance~ If you have any questions, let me know. According to Zander, Neon's your regular everyday guy, willing to help out his friends whenever he can, likes to have fun and such. He is also very good at doing impressions to perfect. 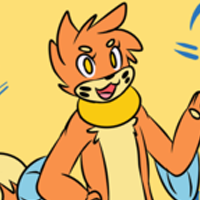 Neon is curious, naive, and flexible. He is 15 years of age. His voicerange would be at least close to Roxas from Kingdom Hearts, somewhat high-pitched, yet still sounding teenage-like. *awed* You're such a cute puppy! And you can talk too?! *triggered* ARE YOU KIDDING ME?! I hate Pikachu! They're so overrated! Why couldn't I be an Arcanine?! *shyly* I'm from the human world. I used to be a human before today. Heh. 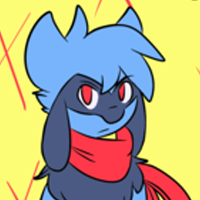 He's the one who takes things seriously the most, besides Mio (Eevee), according to Zander. Having a harsh past and abusive father, he has gone through quite a lot. In my opinion, I think he has self-doubt and low confidence in himself, perhaps due to the abuse and high standard from his early training. He doesn't usually easily trust anyone. Then again, despite his quiet, sarcastic and distant nature, he wants to help out his friends and does so whenever he can. Zander is loyal, genuine, and trustworthy. He is 15 years of age. HUGE UPDATE: Anyone doesn't have to do this exactly, as to give anyone more of a chance, no need to be British or whatever. It is up to anyone's interpretation on how the character would sound and such, and hopefully who knows which could be the closest, it depends. *dumbfounded and confused* Puppy? I'm 15 years old. *suspicious* I knew it! This guy, he's clearly off his meds! She'd have to be crazy if she agrees to help him! *sarcastic* Hey Izzy, are you finished freeing Neon yet? This guy is boring me and I would like to leave now. Lol, but seriously, Izzy is happy, hyper, loud, expressive, according to Zander himself. She tends to have a jolly personality and wants to keep spirits up, not wanting to back down or give up in a situation. She tends to be optimistic and slow to anger, though things could get tense if she does. She cares deeply for her friends and wants to go on adventures with them. Most of the time, she tends to say "Coolly!~". She is however not good when it comes to cooking or singing. She is 14 years of age. Izzy could sound like Madoka Kaname from Madoka Magica, except a bit high-pitched, maybe close to Pinkie Pie, but not too high pitched. She has a lot of energy. Pretty energetic, an optimist, and quite a fast talker, but not so much to the point where it becomes too fast that it's unclear. According to Zander again, her voice has this energy to it. It's not as doubtful, like she's confident, the way she sounds. All I want in exchange for helping is your friendship and maybe some food! So, where do you live? *happy* You're so supportive, Zander! First the free ice cream, and now a cheesy, heartwarming speech?! You're not coolly yet... but you're alright! Based on context interpretation, Zander seems to have a past with this guy. Luxray was locked up and served a 3-year sentence, initially 5, after Zander's former team hunted it down, yet, misunderstood when really he is taking back an artifact for his tribe. He loathes rescuers, explorers, bounty hunters, pretty much civilized Pokemon considering he is wild. He tends to have an aggressive nature and wants to pick a fight. 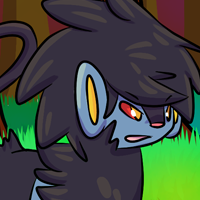 According to Zander, Luxray has a roughness to his voice. Like when you've just drank coffee and haven't cleared your throat yet. You and your so called 'team Storms of Fate' got me locked up for almost 5 years! If it wasn't for my 'good behaviour' I would still be in there for another 3 years! Didn't you know? This is my tribe's homeland. They're setting up traps to capture thieves and trespassers. We stole back what was OURS! It was STOLEN FROM US and then it was SOLD TO THAT MUSEUM! 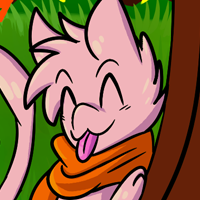 Newt's the pink Mew with yellow eyes and orange scarf. He, albeit, a thousand years old, he doesn't sound that way and is more so like a young lad. According to Zander, Newt has a somewhat medium voice maybe a little high pitched, but it's playful. cocky like voice. He sounds like an adult, but acts like a teenager a bit unless he's being serious. In other words, tone changes depending on mood, from energetic to stern. He is somewhat in the middle, somewhere between mature and immature. He can be serious, but he's also playful. Pretty much not much is known yet about it, so it may be interpreted in any way.